Hello everyone…I wasn’t sure I was going to make it today but here I am and really…there’s no place I’d rather be. The heck with laundry, cleaning and all that other fun stuff! None of it is going anywhere and I’m sure it will be waiting when I finally get to it. Anyway, thanks for stopping by because I’m sharing my latest wreath with a super simple step by step to go with it. My daughter’s house is a little brick bungalow and it needed something new on the door. We went to Hobby Lobby and got what we needed. The first thing I did was cut apart the bushes of flowers. 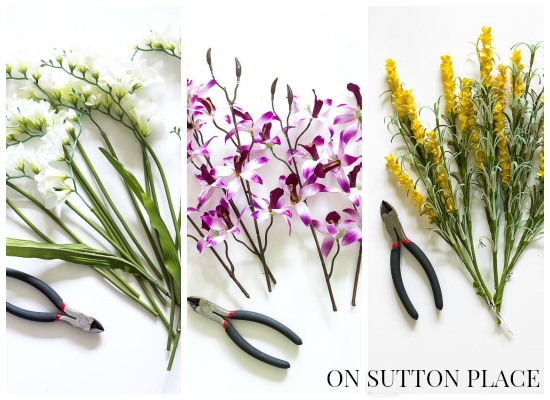 Just fan them out and use wire cutters to cut the stems off as close to the end as possible. You want single stems that can be easily inserted into the grapevine. Decide where you want the flowers. We wanted them grouped on the left side of the wreath so we started there. Begin with one flower and just stick the stems into the grapevine. No glue or wire is needed. Once you have the first color in, move on to the second and third. 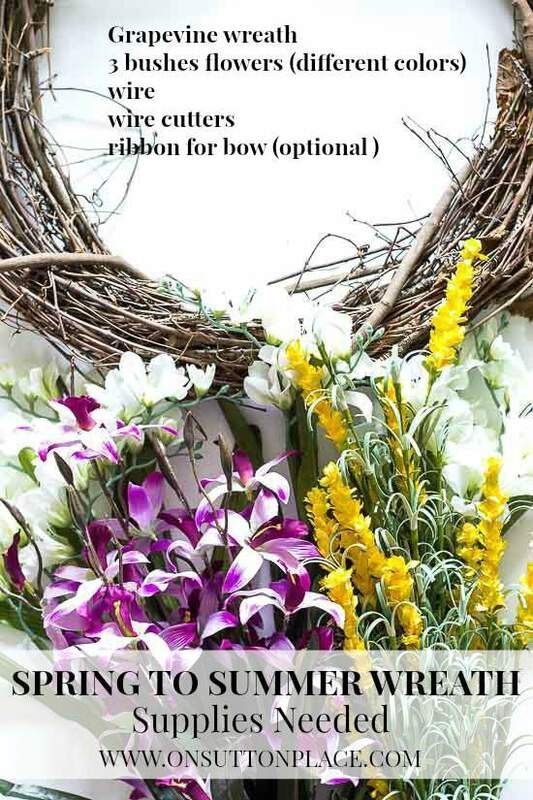 To get a wispy, sort of airy look don’t stick the flowers in the wreath all at the same place. I actually used the whole left side (to the center) of the wreath as the base for our flowers. Stagger them a bit and don’t be afraid to pull them out and try a different spot. When the flowers were all in the wreath I realized that I had a blank spot where the stems went in. The answer to that problem was, of course, a bow. 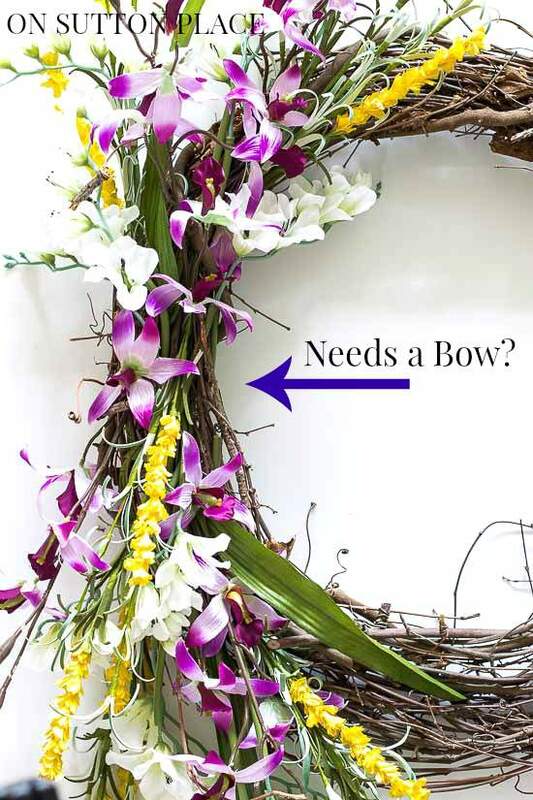 You could make a fancy looped bow, or follow my tutorial on How to Make a Perfect Bow…or you could just tie a simple bow around the wreath with a piece of ribbon. I chose option 3. Here is the finished wreath hanging on Elizabeth’s door. Last year, I spent a few weekends at Elizabeth’s house working on some curb appeal projects. We had a very small budget but managed to fix things up. This year she had more ideas, and a little more money, so I hope to show you those soon. I need to NOT forget my camera the next time I visit. What blogger does that? 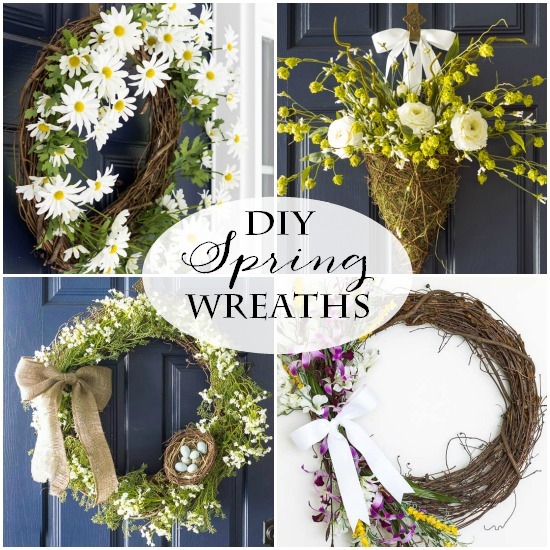 Click HERE for more spring wreath inspiration! Ann, you always make things look so simple and easy! As a result, many of us try out your great ideas as well. You give us all confidence! Thanks! Ann, I was just thinking about something new for my front door and voila! 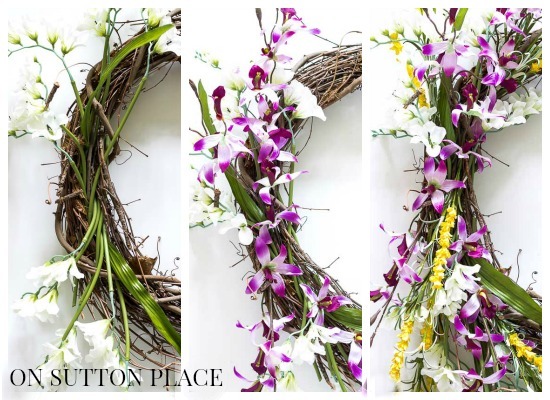 You come up with a great wreath! I looked at your post from your daughter’s place and I have to say a few little changes and sprucing up can make a world of difference. Her place looks great! I did a similar thing with my front door. We were thinking of replacing it, the previous owners did not take very good care of the door and the bottom (it’s a wood door) was separating. The door otherwise was in good shape and the inside was very good. We liked the style with the small diamond window so I decided to strip the door, stain it and my hubby put a brass kick plate at the bottom of the door. Problem solved, The kick plate hid the peeling wood and we had a great looking door! I’m so glad we did that. Well, thanks for the wreath idea. I will be getting on putting that together soon. I’m so glad you chose us over the laundry and cleaning today! I love your pretty wreath and it is the perfect addition to your daughter’s door. I followed the link to her curb appeal projects, and you ladies did a great job sprucing up the place. What a charming home! Thanks for the inspiration! 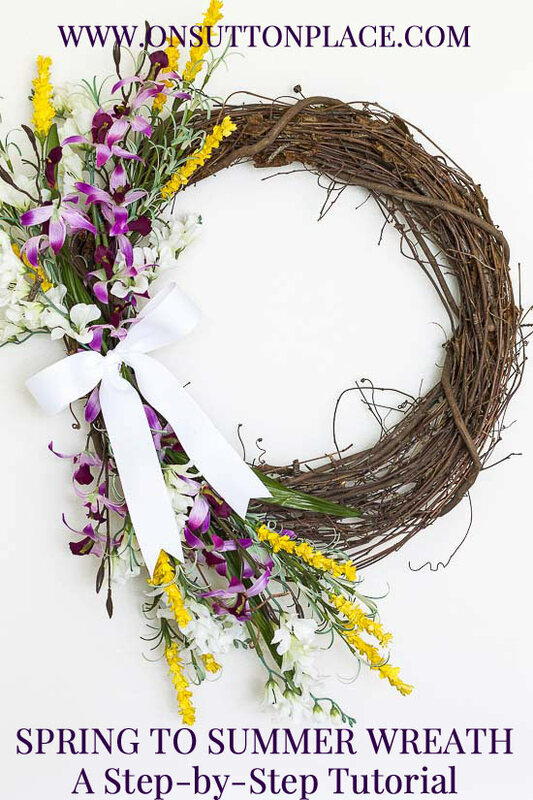 Your wreath says “Spring”. I just love it and hope to make one myself soon. Thanks for the info. So pretty Ann and looks great on your daughter’s front door. 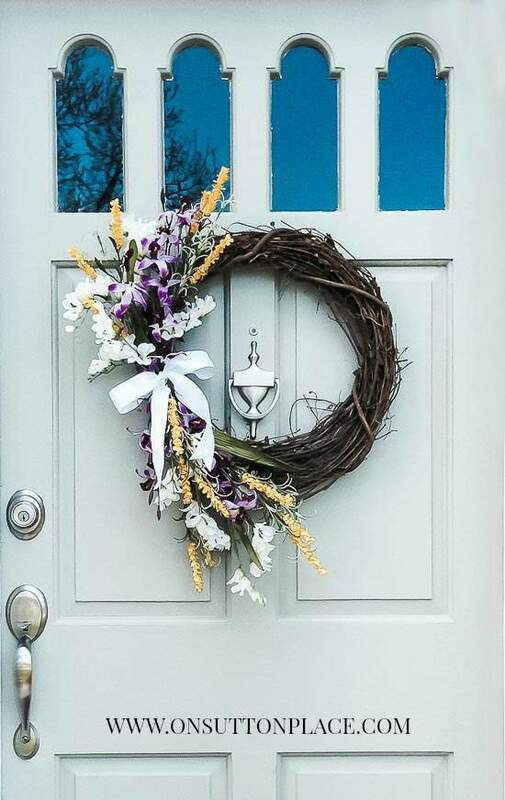 It makes such a difference to have a welcoming wreath on the door, and yours is perfect. So pretty and delicate; a great addition to a soft color front door. I enjoy doing wreaths as well, and just recently did one for my daughter’s front door (which is black). I was able to find some “faux cotton bols” recommended to me by Sophia’s blog. I used a very narrow burlap ribbon to create a bow. She was thrilled with it. I think I have enough supplies in my craft container to try one of these.. So lovely! You are very talented in so many ways with decor and sewing. a touch of spring for a lovely grey door, beautiful! That turned out perfectly & looks great on her front door!